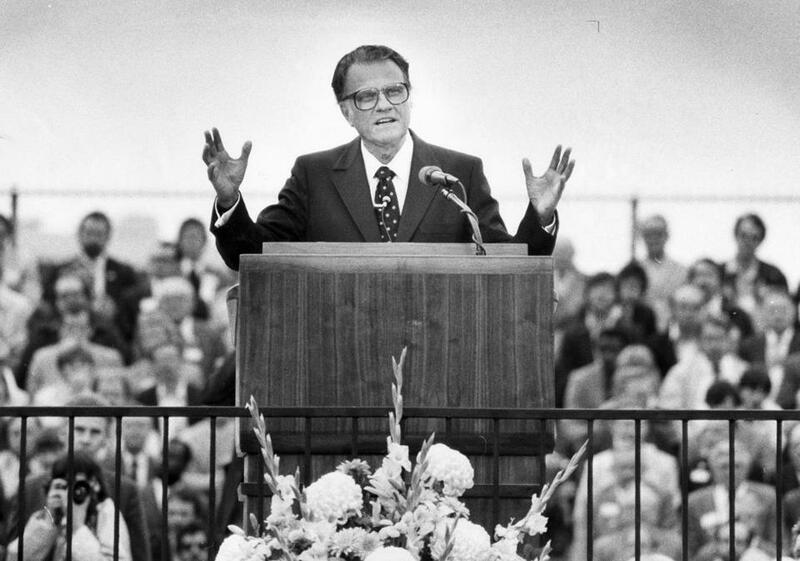 Evangelist Reverend Bill Graham greets thousands who came to hear him preach at Boston University&apos;s Nickerson Field in Boston on May 30, 1982. Famed evangelist Billy Graham, who died Wednesday at age 99, was no stranger to New England. Beginning with a 1945 visit for a religious conference in Swampscott, and rallies in Boston in 1949, he visited the region several times through the decades to spread his message. Here is a look back at some of his local appearances. ■ Graham conducted his first large crusade — his name for his large preaching campaigns — in Boston in 1950. In January that year, 16,000 people filled the Boston Garden (more than 5,000 were turned away) to hear Graham, in what the Globe called “the greatest revival meeting New England has seen in the present generation.” An estimated 3,000 people streamed down to the stage in response to Graham’s plea to accept Christ. ■ In April 1950, Graham waged a five-day “battle against sin and Satan’’ in Boston. The visit began in Park Street Church, moved to Mechanics Hall, and ended with a service on Boston Common that drew a crowd of 50,000. Midway through his stirring talk, Graham urged the audience to take out handkerchiefs and hold them up, according to a Globe account. Graham told the campus newspaper his goal was simple: “If just one student at Harvard would go back to his room tomorrow night and make a commitment to Christ, who knows what might come of it?” he said. ■ Graham made his biggest splash in New England in 1982, launching a three-month tour with stops on six university campuses and seven more cities. On May 30, Graham addressed a crowd of 25,000 at Boston University’s Nickerson Field as Memorial Day traffic streamed past on the Massachusetts Turnpike. ■ In September 1999, the 80-year-old Graham spoke to a standing-room assembly of students and community members at Harvard’s Memorial Church. “We’re looking for answers, and Jesus is the answer,” he said. Graham also admonished young people to stop searching for the meaning of life in material things. “They never really find an answer until they find it in God,” he said. Seppo Rapo, a Harvard Medical School graduate, who attended the service with his wife, found comfort in the preacher’s words. “The message is so simple and plain, but changes a life so dramatically,” Rapo said.